"… and thou wilt cast all their sins into the depths of the sea" (Micah 7:19 AV). At the close of the book of Micah, the prophet asks the Lord, "Who is a God like unto thee, that pardoneth iniquity, and passeth by the transgressions of the remnant of his heritage?" (7:18a). He proceeds to say that God does not retain "his anger for ever, because he delighteth in mercy" (v. 18b). Someone has said that "grace" is when we do get what we do not deserve, while "mercy" is when we do not get what we do deserve. Next, the prophet makes another statement about God: "He will turn again, he will have compassion upon us; he will subdue our iniquities…" (v. 19a). Finally, Micah begins not to speak merely about God but to address God directly: "and thou wilt cast all their sins into the depths of the sea" (v. 19b). This metaphor captures the complete expurgation of sin that occurs when God in his mercy fully pardons sinners. Our sins are dropped like a stone to the bottom of the sea. In Psalm 103:12 David sings, "As far as the east is from the west, so far hath he removed our transgressions from us." Now, admittedly, we need the analogy of faith (the full and consistent witness to right doctrine as revealed in all of Scripture) fully to understand how God gives so great a forgiveness. He does not merely "wipe the slate clean" or "forget about our sin." No, he has a means for the removal of sin from his holy sight. That means in the cross work of Christ. "Surely he hath borne our griefs and carried our sorrows" (Isaiah 53:4a). We should know this. The Christian stands in a completely different place than the man who does not confess faith in Christ. You may struggle with sin still, but in the most ultimate sense you have already received forgiveness. Do not let the accuser of the brethren antagonize you with the memory of all the ways you have fallen short of God’s glory. If you stand in Christ, He has cast yours sins into the depths of the sea! An online article in Christianity Today reports the recent find of 47 NT manuscripts in Albania (read here). A team from Daniel Wallace's Center for the Study of New Testament Manuscripts went to Tirana to photograph the texts (read the Center's longer article on the find here). They were expecting to see only 13 documents but were shown 47 (only two of which had been previously recorded on microfilm)! This is a huge find in the field of textual criticism which normally discovers only a handful of such documents (and those usually mere fragments) each year. This only adds to the fact that the NT is the best attested of any ancient text. The vast majority of the nearly 1700 manuscripts that have John’s gospel in them also have this story wedged between John 7.52 and 8.12. Although they represent the majority, almost all of these manuscripts are late. Relatively speaking, there are very few manuscripts that do not have the passage at all, and an even smaller number that have it but place it at the end of the four gospels. The manuscripts that lack it number about 250; of this number, 111 are manuscripts without commentaries. To this number can now be added one more manuscript, Albanian National Archive (ANA) 15, an eleventh to twelfth century minuscule manuscript that contains the four gospels. At John 7.52, the scribe simply continued on to write John 8.12. A later scribe, incensed at what he thought was an oversight, took a piece of paper and carelessly stitched it into the front of the next parchment leaf (using only five stitches!) and scribbled the passage on it! Wallace's bias for the current eclectic, modern critical Greek text, over against the traditional (Byzantine or Majority) text of Scripture is evident in his description of the PA being "wedged between John 7:52 and 8:12." Would it not be equally possible to say that the PA was "ripped out" of the true text? Sounds like the Albanian find will do little to alter the current modern critical Greek text which has long knew of the disputed transmission of the PA.
Modern translations based on the modern eclectic text already make note of this interpretive difficulty. The ESV, for example, inserts this note in brackets after John 7:52: "The earliest manuscripts do not include John 7:53-8:11." A footnote then adds this further information: "Some manuscripts do not include 7:53-8:11; others add the passage here or after 7:36 or after 21:25 or after Luke 21:38, with variations in the text." Translations based on the traditional text (like the Authorized Version), however, simply include the PA, following the vast majority of NT witnesses. The NKJV also includes the text and adds this maginal note at 7:53: "NU [modern critical Greek text] brackets 7:53 through 8:11 as not in the original text They are present in over 900 mss. of John." 1. On what grounds can Wallace say that the PA is "his favorite passage that's not in the Bible"? He does so on the assumption that the minority texts that omit the PA are earlier and more authentic. He sees the traditional text as the corruption. The question is whether or not such as assumption is justified. The other possibility (and one held until only recent times) was that the minority texts which omit the PA were a corruption of the traditional text. I lean in the direction of the second assumption. The PA is in the Bible! 2. Are statements like Wallace's and notes like that in the ESV that explain textual omissions and transpositions helpful in building up the faith of God's people in the authority of God's Word as they read it? Here we might even call into question the notes in the NKJV though it defends the traditional text. In Alfred Level's little booklet The Old is Better (Gospel Standard, 1994) he offers this critique of the NKJV notes: "These footnotes are of interest to scholars, but for the humble believer, they can be trouble. Constantly to see 'NU text omits...' or 'NU text reads...' at the bottom of many pages can sow seeds of doubt, or perplexity, especially in younger minds, as to what is the true text. All these notes would have been better left out" (p. 38). 3. This discovery points to a theological and ecclesiological problem for those who have abandoned the venerable traditional text. This find seems fairly inconsequential, but what if scholars discover texts in the future in some formerly closed country that are very early in date but feature major omissions, transpositions, or even additions? What if (like the ending of Mark in some texts) they omit, for example, the ending of Matthew or Luke or John? Or, they omit the ending of Romans or transpose passages, etc. Will all the modern translations then alter their renderings to reflect the later finds? For those who have abandoned the traditional text, there is a situation of utter instability. What does this do for the sense of certainty for understanding and preaching the Word of God? The number of people baptized in Southern Baptist churches fell for the third straight year in 2007 to the convention's lowest level since 1987. Although the SBC added 473 new churches and gave more than $1.3 billion to support mission activities around the world, Thom S. Rainer, president of LifeWay Christian Resources, said there's no escaping the fact that Southern Baptists are not reaching as many people for Christ as they once did. LifeWay gathers the year-to-year information on the convention's behalf. "This report is truly disheartening," Rainer said. "Total membership showed a slight decline. Baptisms have now declined for three consecutive years and for seven of the last eight years, and are at their lowest level since 1987. Indeed, the total baptisms are among the lowest reported since 1970. We are a denomination that, for the most part, has lost its evangelistic passion. "Membership in SBC churches, 16,266,920, fell from 2006's total of 16,306,246, or .24 percent. It is the second drop in membership experienced by the SBC in the last decade. In 1998, membership fell 1.02 percent but increased the next year and recovered to a positive trend in 2000. Prior to that, the last drop in membership was 1926. As I have been saying for four years, don’t buy the statistics that claim we baptize 350,000 people a year. Those stats are bloated because of toddler baptisms, “rebaptisms” of tender-conscienced souls who are casualties of a tacky revivalism, and the immersion of new church members who have come to our churches from other types of churches that do not share our baptismal convictions. If we annually baptize 75,000 lost people over the age of 12 who are not already attending our churches’ activities, I would be shocked. We are far less evangelistic than you think we are, but too proud (and pragmatic) to admit it. Why might this report be a cause for rejoicing? 1. It strikes at the heart of SBC hubris. 2. Fewer baptisms might mean fewer incidents of false assurance given to baptized non-believers. 3. It might encourage more thoughtful evangelism and more disciplined understandings of church membership. On our Spring Break trip to Mount Vernon, we stopped off in Fredericksburg at the site of the Civil War battle that took place there in December 1862. A short walk down the "sunken road" is this monument to Richard Rowland Kirkland of South Carolina, who left the Confederate wall to give water to wounded enemy soldiers caught between the lines. For this he gained the title, "The Angel of Marye's Heights." Kirkland himself would later fall in battle. I was struck by the memorial to this young man and the reminder that even in war there can be acts of civility, mercy, and kindness. One might also draw a dim analogy to the one who gave up himself to rescue his enemies. We've been following the controversy at moderate former SBC Broadway Baptist Church in Fort Worth, Texas. News came last week that the embattled Pastor, Brett Younger, who stood for including homosexual couples in the church directory has resigned in order to take a post teaching preaching at moderate, CBF-related McAfee School of Theology at Mercer University. Read the ABP article here and the Baptist Press article here. JPBC's Marcus Deel is back from attending the 2008 "Together for the Gospel" Conference in Louisville. You can listen to or download the sermons from this year and from 2006 at monergism.com (here). I am planning to listen through them this week. They also have the book giveaway list posted. I attended the first stop of Alex and Brett Harris’ "The Rebelution 2008 Tour" Youth Conference on April 5, 2008 in Hickory, NC. I went with a group of parents and teens from my church. My 14 year old daughter was also one of the participants. When our youth parents met last year to look for upcoming events or conferences we might attend, a desire was expressed to attend an event that was not of the typical evangelical youth camp variety. We thought we had found a winner in the Rebelution Conference and went to the event looking forward to hearing the challenge to "Do Hard Things." The following is a review and critique of the event. First, some general information. The conference was held on the campus of Lenoir-Rhyne College. There were about 1,500 youth and adults present, completely filling the meeting auditorium. The conference met from 9:00 am to 5:00 pm and consisted of four plenary sessions. Session 1 was led by Alex Harris; session 2 by Brett Harris; session 3 by Gregg Harris; and session 4 featured brief presentations by all three plenary speakers. Alex and Brett Harris have gained notoriety through their therebelution.com website and blog. They are home-schooled 19 years old twins and the younger brothers of Joshua Harris, author of the popular evangelical book, I Kissed Dating Goodbye. They advocate "a teenage rebellion against low expectations" typified in their motto, "Do Hard Things." The Harris brothers have a new book titled (naturally) Do Hard Things which is being released this month (April 2008) by Multnomah. Their father, Gregg, is a pastor and leads Noble Ministries. Another older brother, Joel Harris, served as the music worship leader for the meeting. The conference was also noteworthy for making use of interactive technology. Youth were given keypads to use and could respond to various questions and surveys during the conference while the results were displayed in mere moments. Second, some affirmations. The first two session led by Alex and Brett were informative and challenging. They did a good job of critiquing "the myth of adolescence," pointing out how the concept of teen culture is a relatively new phenomenon (e.g., the word "teenager" was apparently first used in a Reader’s Digest article in the 1940s!). Previous generations expected young people to act in a mature manner and to behave responsibly. The historical examples given were effective. George Washington was a surveyor at age 17 and was the head of Virginia’s militia at 23. David Farragut was a sea captain at age 12. Clara Barton was serving as a nurse at age 11 and went on to found the Red Cross. The twins did a good job of challenging the youth to see their teen years not as a time to coast but as a launching pad for their futures. They reminded the youth that acting responsibly and learning valuable skills (like simply being able to carry on a meaningful and respectful conversation with adults) would require practice and endurance before being securely mastered. Third, some critiques. I have to say that there also some disappointments in the conference that make me hesitant to give it full endorsement. In reflection on the event, the foundational critique can be summed up in the idea of "mixed messages." What were the mixed messages? On one hand, the children (and adults) were being encouraged to live in a way that is separate and distinct from the world. 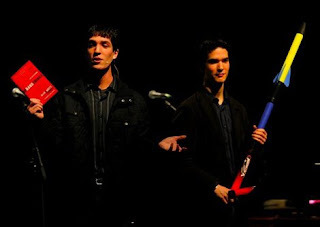 The worship music in the conference, however, was rock based contemporary praise music. Joel Harris led with a strong voice on guitar accompanied by a youth praise band. Before the conference I had anticipated that the worship would not be traditional, but I did not know how loud and driving the music would be. Here is where the problem of a mixed message arises. The rock musical style includes a non-verbal level of communication, even when the lyrics are "Christian." It communicates sensuality and an anti-authoritarianism, precisely the opposite messages that stressed purity and submission (to God). For more reading on this, see Dan Lucarini’s Why I Left Contemporary Christian Music (Evangelical Press, 2002), and the book he co-wrote with Don Blanchard, Can We Rock the Gospel? Rock Music’s Impact on Worship and Evangelism (Evangelical Press, 2006). 2. In promotion of "celebrity." This is a difficult issue for any Christian whose ministry achieves notoriety. Alex and Brett were presented as teen heartthrobs. At each break, teens (primarily girls) mobbed them seeking autographs. Again, there is a mixed message. How do we tell Christian children to resist the "Teen Beat" style worship of celebrity when we seem to be creating an eerie "Christian" alternative? Again, on one hand the twins presented criticism of the jaded culture’s marketing to teenagers as consumers. On the other hand, there was an overemphasis on promotion of t-shirts and books. Every break between sessions featured extended give-aways of one or two items that were available at book tables in the auditorium lobby. Sometimes these book promotions seemed longer than the plenary sessions themselves. Granted, it was fun to see a room full of children jumping up and down hoping to "win" a copy of Wayne Grudem’s Systematic Theology! Still, the book promotion undercut the sincerity of the event. Though there was an offer of a pay-what-you-can policy on the books for those who could not afford them, it seemed unlikely that many (if any) in the auditorium would take them up on the offer. One problem with this sort of thing is the line between a business and a ministry. On one hand, this is a ministry. But on the other hand, this is their livelihood. This seems to be an especial problem in the homeschool community where an entrepreneurial spirit and family micro-businesses are promoted. The problem is that the intended objects of ministry can come to feel more like customers than congregation, and the ministers more like salesmen than servants. This was the most troubling part of the meeting and one I had not anticipated. In the third session, Gregg Harris preached a gospel message. Though it started slow, by the end Harris was giving an engaging presentation of the gospel. He spoke clearly about sin, God’s wrath, Christ’s cross, grace, and faith. The trouble came at the end when Harris offered an altar call that raised ethical and spiritual questions. He asked the students to respond to a series of interactive questions with responses displayed on the screen. It concluded by recording that c. 200 of the students present were either not believers or were uncertain of their beliefs. He first urged those students to believe in Christ. Next he asked those who had done so to stand. When a few scattered individuals stood, he poured on the guilt telling them that if they could not stand in a room full of people who would applause their actions, how could they stand for Christ in the world. With substantially more standing he then invited them all to come to the front of the auditorium. Several hundred youth walked forward. The speakers gave a book from the book table to each (not a Bible as one of the parents in our group pointed out!) and sent them back to their seats. Why was this a mixed message? The Christian life had been presented as a matter of "doing hard things" for Christ. The altar call made it all a matter of standing up and walking forward. On one hand, Gregg Harris has decried superficiality and nominalism among evangelicals quoting SBC statistic that over 80% of those involved in church youth groups eventually drop out of church. On the other hand, the method of evangelism he employed is precisely the cause of so much nominalism. One parent in our group asked, "How many of those who went forward were truly saved and how many may have been given a false assurance of salvation, because they ‘walked forward.’"
The Harris brothers are great fans of reading. I would suggest two books that might lead them to remove the high-pressure altar call and, thereby, greatly strengthen the Rebelution Conference experience. Those books would be Walter Chantry’s Today’s Gospel: Authentic or Synthetic? (Banner of Truth, 1970) and Iain Murray’s Revival and Revivalism: The Making and Marring of Modern Evangelicalism 1750-1858 (Banner of Truth, 1994). In conclusion, the conference had many notable and laudable aspects. It has provided plenty of material and opportunity for fruitful conversation with my daughter, who generally enjoyed the event. If only the messages had not been so mixed. Note: I am also sending a copy of this review and critique to the Harris family. Sermon of the Week: Joel Beeke on "Temptations Men Face"
I commend three messages from Joel Beeke on "Temptations Men Face." The first message deals with temptation to lust (here), the second with temptation to power (here), and the third with temptation to money (here). All are brimming with excellent admonitions for men. "And I will restore to you the years that the locust hath eaten…." (Joel 2:25 AV). Do you ever live with regrets? Maybe you regret the way you lived before you became a believer in Jesus Christ. Perhaps you are plagued by recalling things from your past that were displeasing to the Lord. Maybe you are suffering with some of the real consequences of past sin. Maybe you regret things that you have said or done, even after you became a believer. You were not home enough with your children as they grew up. You have uttered harsh words in anger. You neglected to cherish and appreciate your wife. You did not offer proper honor to your parents. You have not invested proper amounts of time in developing the spiritual disciplines of prayer, scripture reading, and meditation. If this is your state of mind, consider the word of the Lord to Israel recorded in Joel 2:25. The Lord promises to restore the years that the locust has eaten. You cannot change the past. You cannot go back and do things over again. But from this moment forward you can give over to God your anxieties about the past and trust Him to restore what has been lost. You can learn from sin in your past and resolve to live fully for Christ from this day forward. Someone said that the best time to plant a tree was twenty years ago. The second best time in now. The Lord promised Israel that after a time of famine and blight, he would fill them. This is his promise to you as well. Note: Evangel article for 4/15/08. I sometimes listen to the "Let the Bible Speak" radio program of Faith Free Presbyterian Church with Alan Cairns. The program features a commentary on some "hot topic" and a sermon excerpt. Of late, Cairns has given a Free Presbyterian take on some recent Baptist follies, like the homosexuals in the church directory controversy at Broadway BC (here) and the New Baptist Covenant (here). The Associated Baptist Press had an article last week on budget shortfalls at BTSR. The moderate Richmond seminary was founded as an alternative to conservative SBC seminaries. They are apparently facing the same problem as the mainline churches they have made their pattern. Namely, they are a liberal school faced with declining enrollment, bloated faculty, and declining (aging) support base. The school is 6 million dollars in debt and running severely behind in its annual budget. For a mere 160 students (and who knows how many of those are actual resident students and not mere occassional "online" course takers), the school has 31 full time professors and administrators, not to mention 14 adjunct professors. New President Ron Crawford's comments are not exactly encouraging: "I continue to say, ‘The future of BTSR is very bright, the short-term is worrisome ... BTSR will survive and, eventually, thrive. We fully anticipate going through a few very lean years.'" The Biblical Recorder of NC ran the article by Robert Dilday. It will be interesting to see if the Religious Herald will do the same, given their tendency to keep on the sunny side with regard to all things moderate. Back from Spring Break vacation. We usually take a week at Topsail Island, NC, but this year we stayed home and worked around the house. My main work was digging and tilling our garden, putting up some fencing around it, getting a load of horse and sheep manure from the Dutnell farm, paiting a bird house, and cleaning my basement. We also took a day trip to Fredericksburg and Mt. Vernon on Thursday. JPBC Webmaster Brian Davis has newly added 11 new book reviews on my Pastor's page at the JPBC website (here). ____, To Be Continued (Calvary Press, 2005). The print edition of the Winter 2008 EFN went in the mail earlier this week. JPBC Webmaster Brian Davis has now posted the online version here. Thomas R. Schreiner and Shawn D. Wright, eds, Believer's Baptism (B & H, 206) reviewed by Marcus Deel. Craig R. Brown, The Five Dilemmas of Calvinism (Ligionier, 2007) reviewed by Steve Hills. Steve West, ed., Ministry of Grace: Essays in Honor of John G. Reisinger (New Covenant Media, 2007) reviewed by Howard Anderson. A reprint of Andrew Fuller's classic sermon, "Christian Churches Fellow Helpers With Their Pastors To The Truth." 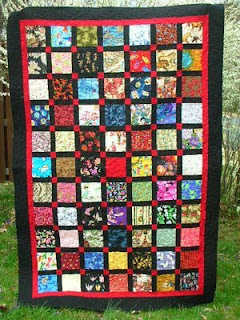 Check out the blog of a quilting expert and new JPBC member. Guess I'm getting in touch with my feminine side!